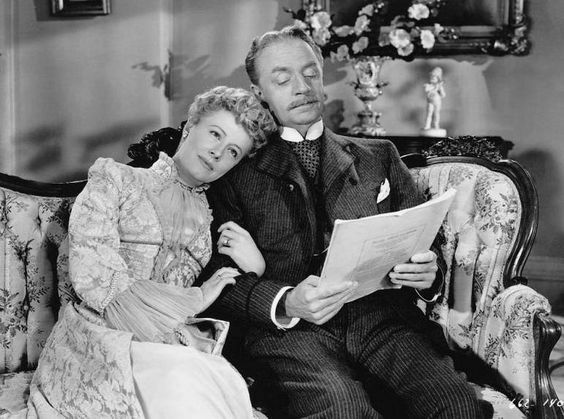 TCM is airing a Thanksgiving Day lineup of family movies that includes Life with Father (1947) starring Irene Dunne and William Powell. If Thanksgiving is a holiday in which your family gathers to watch classic movies then you're in for a real treat this week. TCM is airing a lineup of classic family movies on Thursday that includes Mrs. Miniver (1942), A Tree Grows in Brooklyn (1945), and Life with Father (1947). There's also two nights of movies about the Hollywood blacklist and 24 hours of James Stewart films. 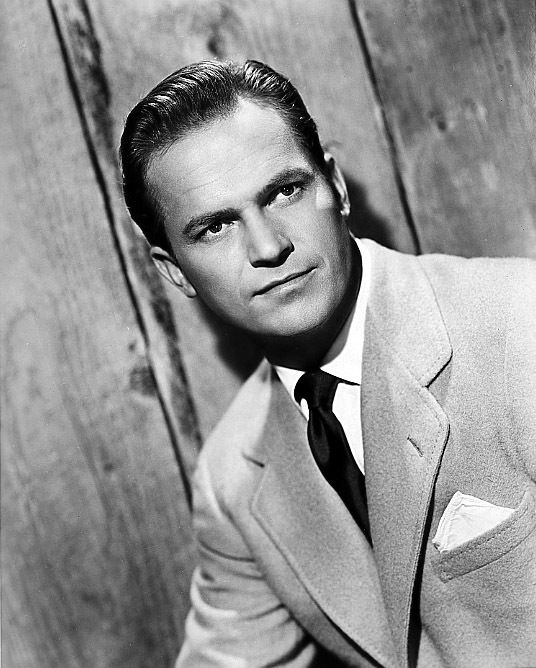 Birthday tributes: Ralph Meeker on Tuesday. Noir Alley: Director Alfred Hitchcock examines the perils of public transportation in Strangers on a Train (1951) at 10 a.m. Sunday. Watch for two of Hitchcock's most elaborate set pieces: A murder seen through a pair of glasses and the merry-go-round finale. TCM Essentials: Naive millionaire Henry Fonda fall for con lady Barbara Stanwyck's significant charms in the Preston Sturges comedy The Lady Eve (1941) at 8 p.m. Saturday. Silent Sunday Nights: The restored version of the John Gilbert swashbuckler Bardelys the Magnificent (1926) at midnight. TCM Imports: Two Italian films about adolescence: First a teenage boy (Marino Mase) struggles with providing for his blind mother and disabled siblings in Fists in the Pocket (1965) at 2 a.m. Director Federico Fellini's masterpiece I Vitelloni (1953) follows five teenage boys who feel trapped in their rural hometown. Best Day to DVR: All day Thursday. The daytime lineup features movies about mothers starting with Spring Byington as the March family matriarch in Little Women (1933) at 6:30 a.m. Greer Garson and family try to survive the Blitz in Mrs. Miniver (1942) at 8:30 a.m., while Irene Dunne plays the mother of a turn-of-the-century immigrant family in I Remember Mama (1948) at 11 a.m. Sally Field plays a widow who tries to save her family farm during the Great Depression in Places in the Heart (1984) at 1:30 p.m. while Dorothy McGuire is the devoted mother to a poor tenement family in A Tree Grows in Brooklyn (1945) at 3:30 p.m. Finally, devoted mother Anne Revere encourages daughter Elizabeth Taylor to follow her dreams in National Velvet (1944) at 5:45 p.m. The prime time lineup is all about large families with Clifton Webb and Myrna Loy raising a brood of 12 in Cheaper by the Dozen (1950) at 8 p.m. while Henry Fonda and Lucille Ball have a blended family of 18 in Yours, Mine and Ours (1968) at 9:45 p.m. Round out your evening with eccentric dad William Powell raising a brood of boys in Life with Father (1947) at 11:45 p.m.
Cary Grant and Priscilla Lane in Arsenic and Old Lace (1944). Three daytime picks: Enjoy an afternoon of screwball comedy starting with Cary Grant and Priscilla Lane spending a memorable Halloween in Brooklyn in Arsenic and Old Lace (1944) at 2 p.m. Jean Harlow, Myrna Loy, William Powell, and Spencer Tracy are at the top of their game as a romantic foursome in the newspaper comedy Libeled Lady (1936) at 4:15 p.m. while Grant and Katharine Hepburn chase an unruly leopard all over Connecticut in Bringing Up Baby (1938) at 6 p.m.
Prime time lineup: Each Monday and Tuesday in November, TCM is airing movies about the Hollywood Blacklist of the late 1940s and early 1950s. During that time period, the U.S. Congress investigated actors, directors, and writers for alleged Communist activity and many were blacklisted, which meant they were barred from earning a living in their chosen profession. Monday's lineup deals with those blacklisted writers, directors, and actors who were forced to work abroad. Several blacklisted people including director Herbert J. Biberman, and actor Will Geer made the powerful pro-union drama Salt of the Earth (1954) at 8 p.m. in Mexico. Blacklisted screenwriter Dalton Trumbo had to use the name of another writer for his screenplay for the Academy Award-winning drama The Brave One (1956) at 10 p.m.
Late night pick: Blacklisted director Jules Dassin moved to Europe where he made such classics as the heist movie Rififi (1955) at 2 a.m.
Three daytime picks: A birthday tribute for actor Ralph Meeker who was born Ralph Rathgeber on Nov. 21, 1920, in Minneapolis. Meeker was a well-regarded Broadway actor when he began appearing in low-budget films like Shadow in the Sky (1951) at 6:30 a.m. in which he plays a World War II veteran suffering from post-traumatic stress. Meeker's macho screen presence made him a top noir actor in films like Jeopardy (1953) at 12:45 p.m. (he's a menacing killer who kidnaps Barbara Stanwyck). Meeker mostly worked in TV in his later career, but he did take on some character parts like playing a heavy in the political drama Ada (1961) at 4 p.m.
Prime time lineup: The spotlight on the Hollywood Blacklist continues with movies that reveal the impact of the blacklist. Screenwriter Michael Wilson did not receive credit for his screenplay for the Civil War drama Friendly Persuasion (1956) at 8 p.m. Wilson and his fellow screenwriter Carl Foreman secretly worked on director David Lean's epic The Bridge on the River Kwai (1957) at 10:30 p.m.
Late night pick: Odds Against Tomorrow (1959) at 1:30 a.m. is a powerful noir about racism and police corruption that was co-written by blacklisted director/screenwriter Abraham Polonsky. 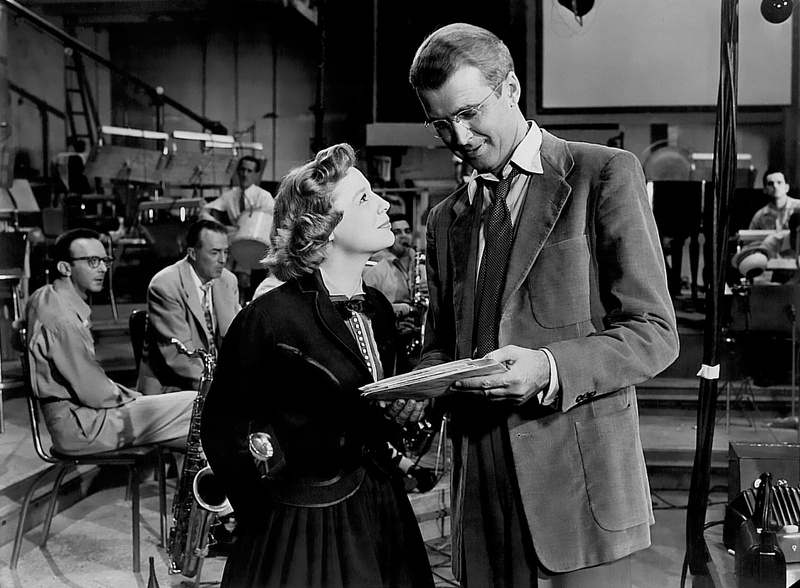 June Allyson and James Stewart in The Glenn Miller Story (1954). Three Daytime Picks: TCM is airing films from star of the month James Stewart all-day Wednesday. Stewart and Dan Duryea are off-shore oil drillers who clash with the Louisiana locals when they disrupt the shrimp trade in Thunder Bay (1953) at 9:15 a.m. (in the most obvious plot twist of all time, Stewart falls for a lovely shrimper's daughter played by Joanne Dru). Stewart plays a dedicated G-Man who looks back on his career in the entertaining The FBI Story (1959) at 1:15 p.m., while he plays the patriarch of a Civil War-era Virginia family who searches for his missing son (Phillip Alford) in Shenandoah (1965) at 6 p.m..
Prime time lineup: The best of Stewart's three films with June Allyson is the biopic The Glenn Miller Story (1954) at 8 p.m. One of his most beloved roles was as addled tippler Elwood P. Dowd in Harvey (1950) at 10:15 p.m..
Late night pick: Stewart is bewitched by Kim Novak in the supernatural rom-com Bell, Book and Candle (1958) at 12:15 a.m. followed by two of Stewart's collaborations with director Alfred Hitchcock: Rear Window (1954) at 2:15 a.m. and The Man Who Knew Too Much (1956) at 4:15 a.m.
Three daytime picks: TCM has a lineup of all-time classics on Friday daytime to go along with your Thanksgiving leftovers. The morning lineup of road trip movies features the Bing Crosby-Bob Hope-Dorothy Lamour comedy Road to Morocco (1942) at 6 a.m. followed by director Preston Sturges Great Depression odyssey Sullivan's Travels (1942) at 7:30 a.m. Ginger Rogers pretends to be a 12-year-old girl to get cheaper train fare in The Major and the Minor (1942) at 9:15 a.m. 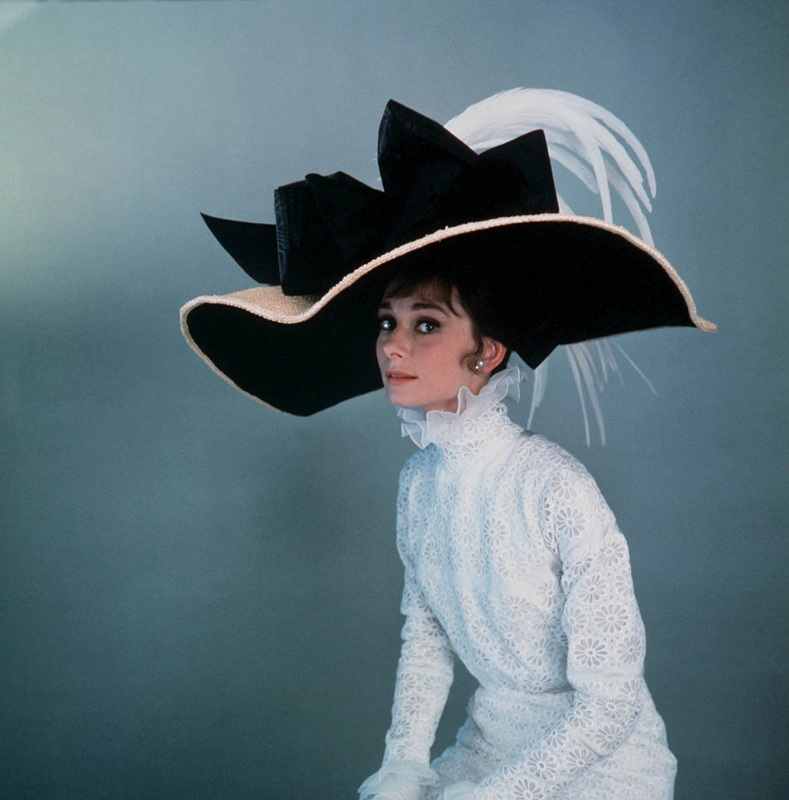 The afternoon lineup is full of classics: How to Marry a Millionaire (1953) at 11 a.m.; The Quiet Man (1952) at 12:45 p.m.; Magnificent Obsession (1954) at 3 p.m., and My Fair Lady (1964) at 5 p.m.
Prime time lineup: TCM's guest programmer for November is actor, writer, and director Matthew Modine. His prime time choices are two films that he saw during their original release at drive-in movie theaters owned by his father: The Dirty Dozen (1967) at 8 p.m. and Cool Hand Luke (1967) at 10:45 p.m.
Late night pick: Modine finds "so much beauty" in the relationships between French prisoners of war in the World War I drama Grand Illusion (1937) at 3:30 a.m. This week's The Essentials film is the screwball comedy The Lady Eve (1941) at 8 p.m. followed by two more films starring Henry Fonda: The Waltons' prequel Spencer's Mountain (1963) at 10 p.m. and the political drama The Best Man (1964) at 12:15 a.m. The prime time lineup is all about road trip movies starting with the story of one couple's relationship (Albert Finney and Audrey Hepburn) told through a series of European vacations in director Stanley Donen's Two for the Road (1967) at 8 p.m. Next Bobby Clark and Brigitte Fossey running away from their Swiss boarding school to join their parents (Gene Kelly and Barbara Laage) in Paris in The Happy Road (1957) at 10 p.m.